I’m just sitting back relaxing, drinking my decaf latte as I let me dinner settle in my belly, debating do I want to share tonight’s dinner with you? Well that’s a silly thought because you know I do. If it’s food related I am up for sharing! I made for the first time ever stuffed Pork Loins. 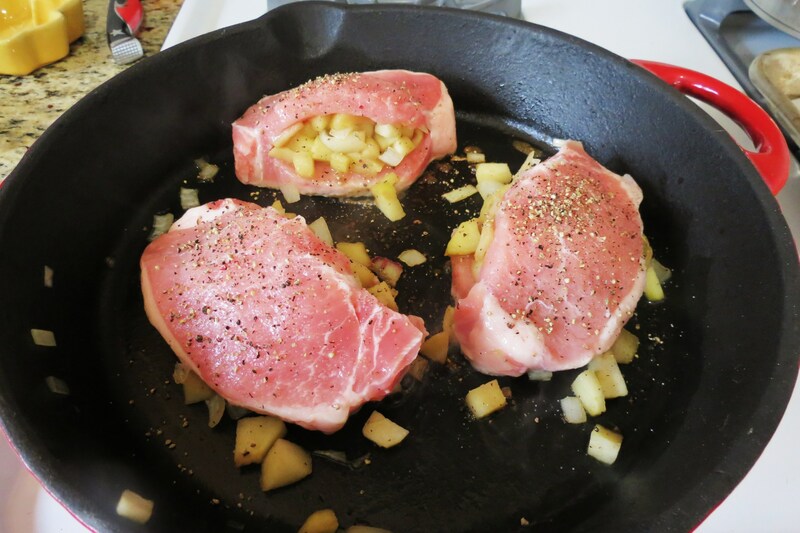 I have made so many variety of pork chops, pork loins, pork tenderloin, but for some odd reason I never made stuffed ones. How crazy is that? 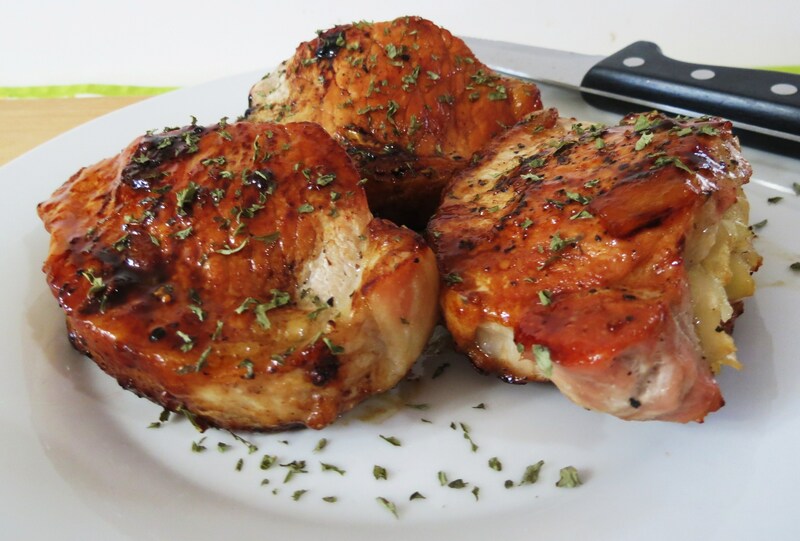 All I can say is it’s easy and I can see why people love stuffed pork chops. Now that I got the hang of it I can’t wait to stuff it with other goodies, but I am not sure if I will be able to top tonight’s pork loin. See their’s one food combination that I really, really, really love and that’s apples and onions together. My friends think it is weird, I think it’s great! Don’t you think cooked apples and onions go together? My friends here in California think it must be an east coast thing because they never heard of the combination and I offer them a bite and they turn their heads with that ewww look on there face. Really? I just don’t get it? My family likes onions and apples, but my Husband thinks sometimes I go a little overboard with it. I have even stuffed Turkey on Thanksgiving with it. I love it!! So what do you think of the combo? I am curious to know. Here’s a picture, just as I was getting ready to sear the pork. I’m showing you this so you can see how I stuffed them. To stuff them, I just took my knife and cut through the thickest part of the pork, but I was very careful not to cut all the way through. The pork was simple to cut, it took like a minute to cut all three pieces. If you happen to over stuff your pork loin, just use a toothpick to seal it closed. Here they are fresh out of the oven. The pan is not going to be fun to clean. 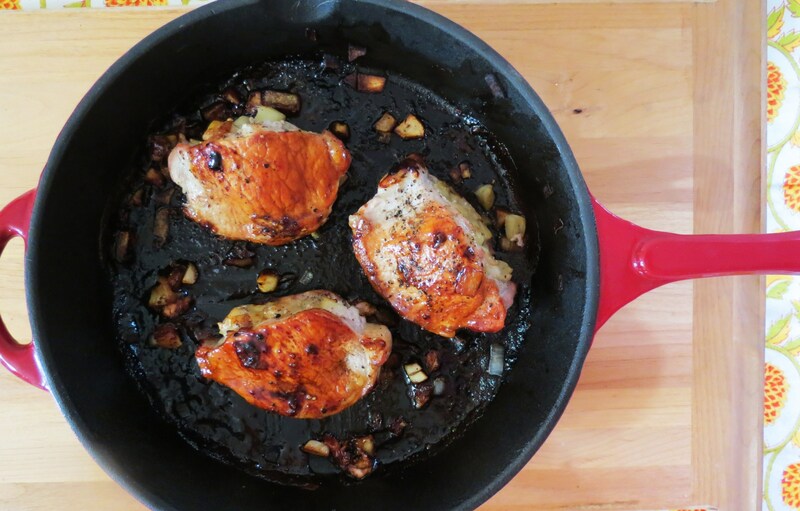 In an oven proof skillet, add butter, apples, onions and salt & pepper. 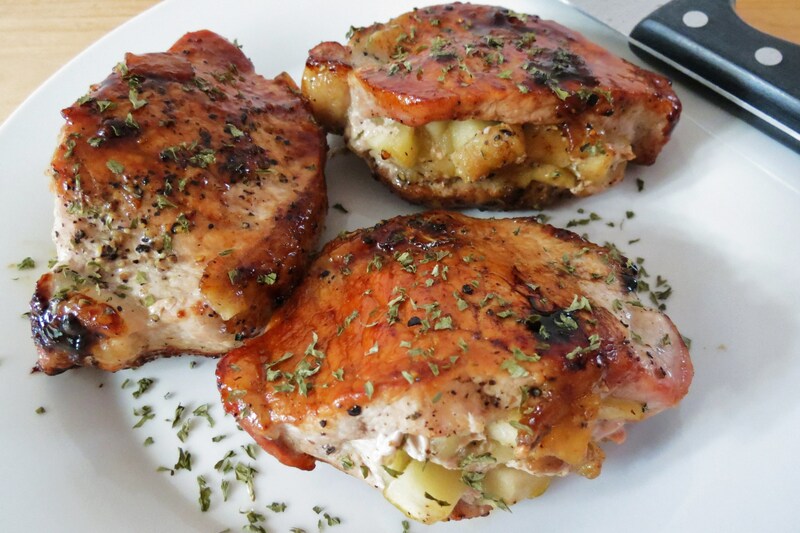 Cook until tender (about 5 minutes), add ¼ cup of apple cider and brown sugar. Stir until and most of the juice is evaporated. Add apple mixture into the pocket of each pork loin. If you have left over, just leave it in the skillet. Add Pork to skillet and brown on all sides. Add remaining ¼ cup apple cider and bake in oven for 30 minutes, flipping the pork half way through cooking until pork is no longer pink. For decoration I added a sprinkle of parsley over the top of my pork. Please note: If you use smaller than 6.6oz per piece your calories will be lower. Aim for 4 oz, than it would be 186 calories per piece. I better go scrub that pan, that is not going to be fun! Do I have any volunteers? Well at least I’ll get some arm exercises in. Don’t forget to enter my Trader Joe’s giveaway! There is only a few days left!! Have a lovely day my Darlings!! Ooo, what a comforting meal! I’ve got a Cocktail Contest going on right now–Come over and link up your favorite beverages!! Apple and pork just go together perfectly. Your pictures make me hungry for this delicious dinner! 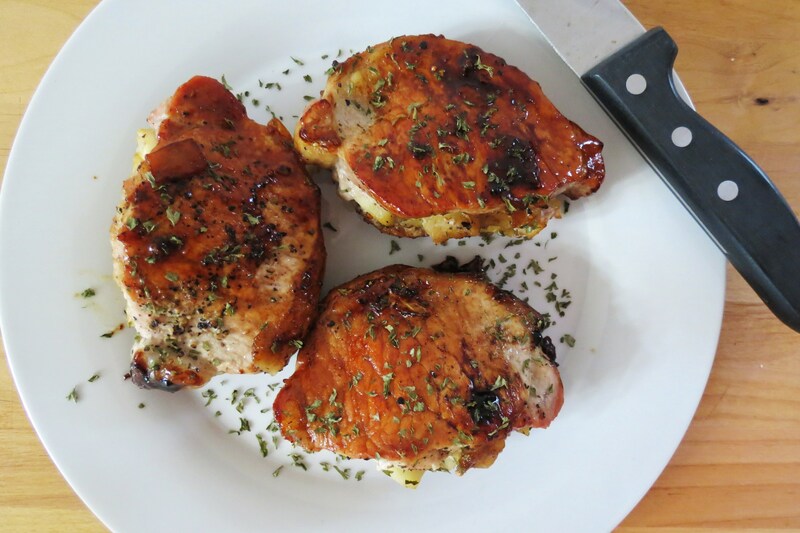 Love this idea for pork chops, Jennifer! They look so delicious with the apple stuffing. These look incredible, Jen! 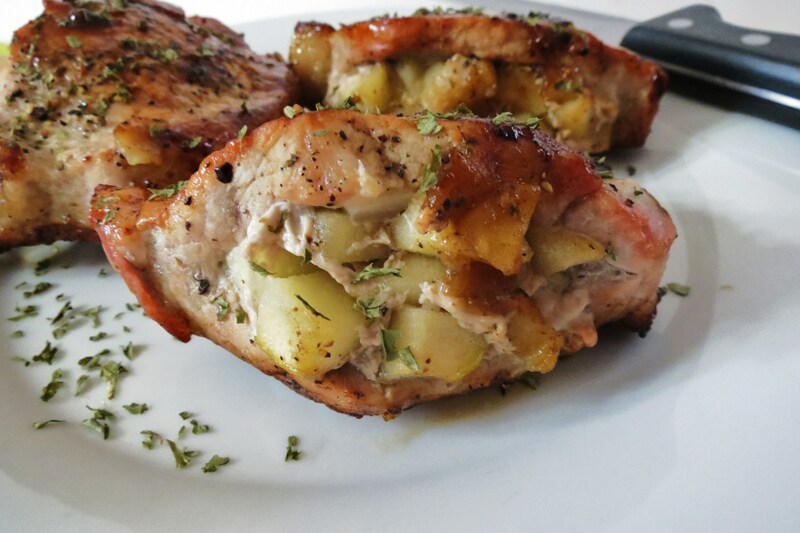 I haven’t stuffed chops in a LONG time..but I always use bread, onion, celery AND apples. SO, so good!!! That is some serious goodness! 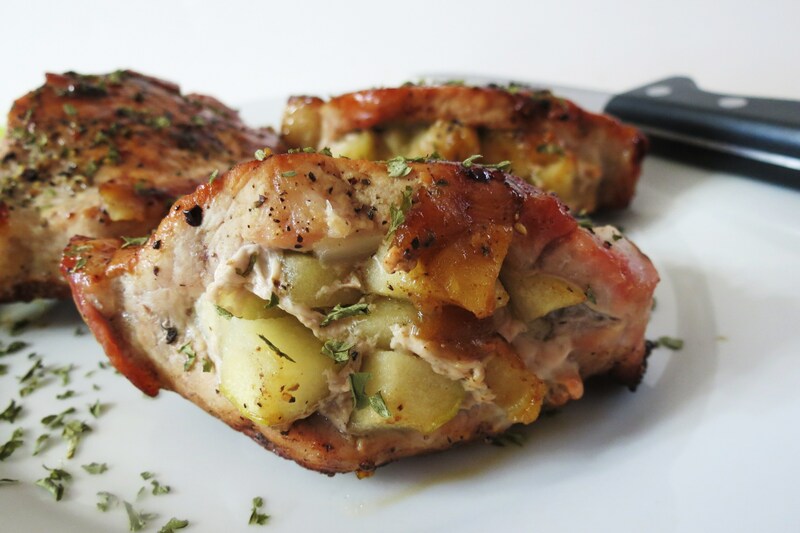 I am not a big pork fan, but when it comes stuffed with apples… I am all over it! I usually serve my pork with microwaved ‘baked’ apple slices. Going to try this one on my family next week. Thanks, Jennifer! Wow, this looks fantastic 🙂 I love apple and pork, what a great dish! I love apples and onions together! And I’m from the East Coast so maybe they’re right? Anyways, this looks amazing! Looks fab, right after you pull those from the pan, deglaze. A little white wine will work good, but, even water will work if done while hot. Then, when you do get to it, it’s much easier. Awesome, thank you Rolf!! 🙂 I appreciate it! I mess up a lot of pans, so I will give this a try! Want to try this recipe. What kind of apples did you use? I think on this recipe I used honeycrisp or a gala. Any semi-firm apple will do. Use your favorite. Let me know how it turns out for you.